Two girls that are soooo exited to go to the movies! This was Haylee's first movie, so we were interested to see how she would do. She is very active and hasn't sat through a movie at home so we didn't know how she would do in the theatre! When we got to the theatre the girls were so excited to see that they had these statues and couldn't wait to get their pictures taken! In our seats waiting for the show to start... Daddy and Haylee were out getting Treats! So ended up being a great movie! Haylee did pretty good .. towards the end she got a little restless , but when it was over she said "Mom, I love the Movie Theatre that was Awesome!" I don't know if I can believe that a whole year has gone by again...I still remember when it was going to be the year 2000 and everyone was going crazy about the computers and if they would work or if they would all crash... Now 10 years later so much has changed in Our lives! I never imagined to have such a wonderful life, be a mother of 2 of the most beautiful, fun , loving girls... They are my world and what I live for, they bring such joy to my life! To have a wonderful , Amazing husband that I love and adore so much . To be a wife and a mother has brought such joy to me and in the next 10 years I can only imagine all the wonderful moments that we will have as a family! Memories are what I want to make for the girls to remember and be able to share with their families! 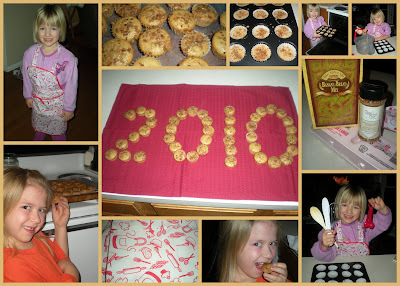 Last night it was wonderful to spend time with the girls making Muffins and playing Mousetrap and continuing to make amazing Family Memories and many more to come in 2010! !